Welcome to the Make Them Notice Podcast! West2East Empire is brand management company based in Seattle and Los Angeles. On this podcast we will talk about sports, branding, pop culture and everything in between. We'd love to hear from you so submit us your questions to @West2EastEmpire and we'd love to have you on the show! Don't forget to #MakeThemNotice. On episode 8 of the Make Them Notice Podcast, former Seahawks QB Austin Davis gives his mid season report of the Seattle Seahawks. He shares what he learned from Pete Carroll, what the Seahawks have to do to make the playoffs, how to be a successful quarterback and who will be in the hunt for the NFL Playoffs. If you've enjoyed the show please rate and subscribe wherever you get your podcasts! On this episode of the Make Them Notice Podcast DJ and Music Producer White Panda joins the Make Them Notice Podcast and shares his break into the music industry, what it's like doing shows across the country and working with the Michael Jackson team. If you have interest in the music business this episode is for you! If you enjoy please rate and subscribe on iTunes wherever you get your podcasts! On this episode of the Make Them Notice Podcast Daniel and Pili talk to Olympic Gold Medalist Nastia Liukin about her journey to the Beijing Olympics, crossing over to an entrepreneur and starting her brand new app Grander. Listen to her inspiring story and how you can live out your dreams! If you enjoy this podcast please subscribe and rate in iTunes. On this episode of the Make Them Notice Podcast Creative Director, Daniel Mogg, sits down with Ben Malcolmson and shares about his new book Walk On. He retells his incredible story of walking on the USC football team as a journalism student covering the team and how he formed a relationship with Coach Pete Carroll. Give it a listen and check out Ben's inspiring book http://a.co/hMU6oxC. The first 10 people to message us will receive a free copy! 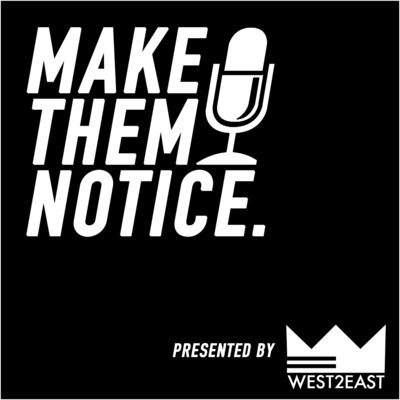 On this episode of the Make Them Notice Podcast we have Creative Director, Daniel Mogg, and Executive Assistant, Rohan Kumar, talk about the ins an outs of Coachella: when to buy tickets, what’s the go to in terms of lodging and transportation, and how to plan so you don’t miss your favorite artists on stage. Later on we welcome special guest, artist and songwriter, Justin Jesso, author of Kygo’s EP “Stargazing” (4:20). Jesso first talks about the opportunity to perform at Coachella’s main stage with other artists like Jamie Fox and Ariana Grande (5:15). Then he explains his “game-day” and pre-performance routines (7:22), and shares a little bit about his Coachella experience outside of performing; getting to see other artists like The Weekend, Beyonce, and Miguel (9:48). Moving forward, Jesso talks about his journey as a songwriter, how he started and where songwriting has taken him so far (16:10), and how he partnered up with Kygo and the success of his “Stargazing” demo (19:00). On this episode of the Make Them Notice Podcast we have Mental Conditioning Consultant Trevor Moawad. Trevor has consulted numerous high level athletes and business leaders around the world. In this episode Trevor discusses the upcoming ESPN show QB2QB that he is featured in (1:30), how he became a Mental Conditioning Consultant (13:00) 3 mental keys you can apply to your life (17:00) the themes of championship teams he's been around (21:00) and is the clutch gene a real thing? (26:00). Please subscribe and rate the Make Them Notice Podcast as it will helps us get the word out! Send in your questions @West2EastEmpire to get featured on the show! Welcome to the Make Them Notice Podcast! Where we talk about sports, media, pop culture and everything in between. On today's episode we tell the story of West2East Empire (2:00) Nike's Brand Strategy at The Masters (5:00), We have Brian Mogg (Golf Digest Top 100 Instructor) give his takeaways from the Masters (7:15) and determine Adam's "Gat-Man" punishment for coming in last place in the West2East Putt Putt Masters (23:00). If you enjoy please subscribe and tell your friends! We'd love to hear from you so please send us your questions on social media!